My wife Kasia and I are moving to a smallholding near her family farm in north east Poland. This website will be a kind of scrapbook where we will record the process of our planning, moving and starting to live and work there. We'll be asking questions and hopefully finding answers and friends along the way... So do join us! 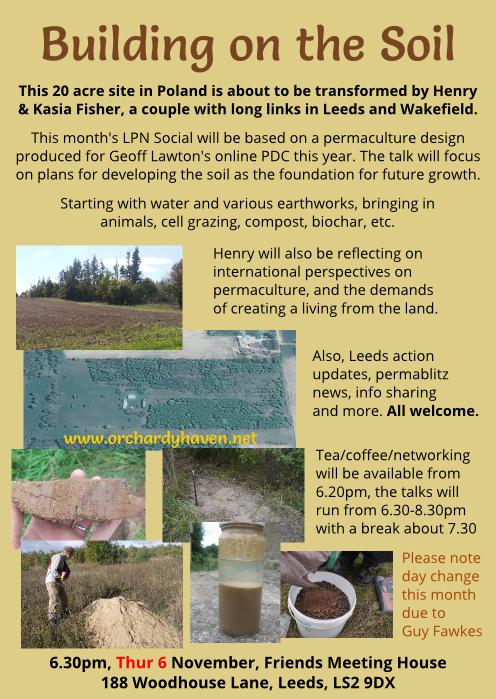 I'm giving a talk at the Leeds Permaculture Network Social about the permaculture design I've done for our OrchardyHaven. Called 'Building on the Soil', the talk will focus on our strategies for building amazingly rich and productive soil that will in turn make an amazingly rich and productive food providing ecosystem for us to live in. I wish I'd said that on the flyer now... Anyway come if you can, it'll be great!